I really dig the frame with its strong imagery of duality. The dove-like bird in the centre of the top border presumably represents the Falcon of Light, soaring ascendant among the clouds. Looks like it's mirrored by a bat-like creature under the words at the bottom, possibly a representation of Femto. The top pillars are the crest of the new band of the Falcon (I think) and a Beherit, possibly representing the light facade in contrast to the dark truth of the neo-Falcons. 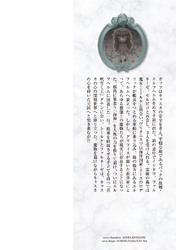 The base of the right pillar obviously represents Skull Knight and the left could be the Godhand or maybe even Void specifically given his opposition to SK and his close association with the brand - or maybe just the curse of the brand. Not sure about that one. In any case, interesting and evocative. I really dig the frame with its strong imagery of duality. do you still have the same opinion about it? Yes. It wasn't an improvement. 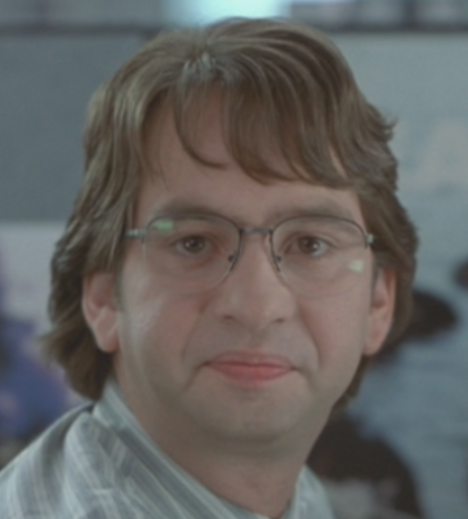 Well I feel really foolish now I was wondering why nobody was discussing it. Thanks for linking the prior discussion. In the context that it's used on every volume, I get why people like it less than I initially did - I thought it was making a thematic statement pertinent to the particular volume. 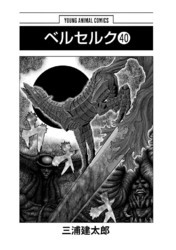 The 40th volume of Kentarô MIURA's Berserk manga will be released on September 28. On this occasion, there will be one (or more?) project around this outing. More information will be provided in the 19th issue of the Young Animal (Hakusensha), which will also be released on September 28.
there will be one (or more?) project around this outing. More information will be provided in the 19th issue of the Young Animal (Hakusensha), which will also be released on September 28. Mostly I pray it's not something horrible (I may have light novel PTSD). I think a big fat apology for the anime, the Musou game, and the light novel would be a worthy Berserk project in and of itself. As would an assurance that the people responsible for greenlighting them have been sacked, but I guess I can't get too greedy. (I may have visual novel PTSD). For conversation, the gist of the above: A studio called Playground Games is staffing up, grabbing some people from recognizable game studios (BioWare, Rocksteady Games, Ninja Theory, and Guerrilla Games) for a new, "open-world action RPG" that's so far an untitled project. Yesterday, a Playground artist dropped a few of these concept art images into his portfolio, along with the comment: "For 'The Berserk Project' I’m working on with fellow artist Sean Ray". 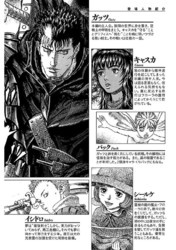 So I looked up Sean Ray on Twitter, and ended up finding his page, showing a bunch of more artwork along with this: "Berserk Fan art work done for a talk given at Industry workshop "what if Guillermo Del Toro was making a Netflix series done with a budget of Game Of Thrones. Work done by me and Conar Cross! more to come ...."
That seems to sink it, to me. 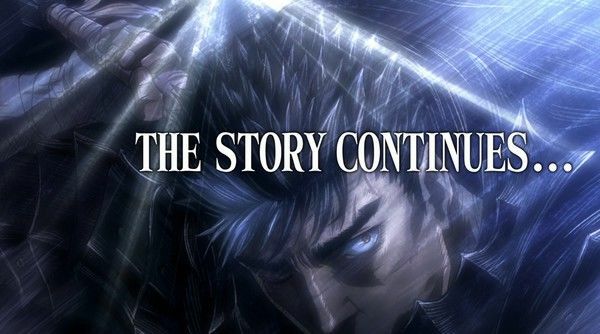 This sounds like a one-and-done collaboration project between artists who both clearly love Berserk and share some coincidental connection to Playground games. I will also add that I think it would be somewhat strange to staff up from such recognizable studios just for a licensed game. 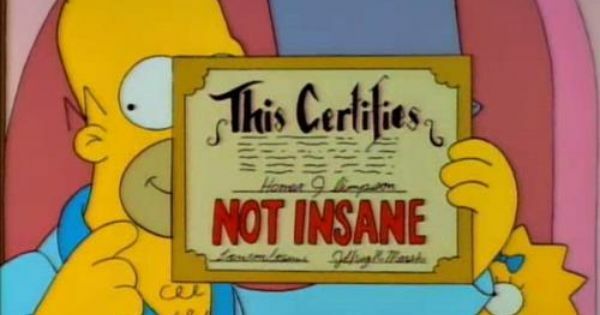 With few exceptions, licensed games are rarely given to the big boys. Usually studios would rather invest in an original property they can own, control, and milk for all its worth rather than one with a series of draconian strings attached. On this occasion, there will be one (or more?) project around this outing. More information will be provided in the 19th issue of the Young Animal (Hakusensha), which will also be released on September 28. On average, what's the time between the Japanese release and a translated, Dark Horse release in English? See you in another 12 years! I guess I can revisit the Hawk of the Millennium Arc and onward (I'm about sick of the Golden Age Arc), and contribute more here. 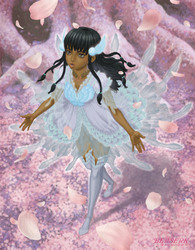 My God Casca looks so lovely! 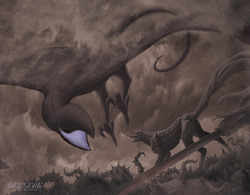 I love that Guts Dog vs Griffith Bird painting too. The colors are nice and moody. Great posters. Love both of them! Sweet we have a Casca poster. And what a poster! I really dig the other one too. Time to clear some space on my credit card and get that volume! Really like the Phantom Femto poster, but I must say, not a fan of the Casca one, her lips look off. The Casca piece has beautiful colors, and I especially like how well drawn her hands are. As Makoto Yukimura said once in an interview "Hands are the most expressive part of a character, after the face". It's a good painting, but one thing that feels a bit off to me is the pronounced digital influence; not that I have anything against digital, but in this case, I feel like there's a visible discrepancy between the pastel colors and theme the painting is trying to convey and the almost gaudy digital highlights. I think the other one does a slightly better job at incorporating the digital medium, but aside from that they both look amazing. Will be a live PV. There will be a PV of the Project(s? ), or the PV is the Project? Live pv (with real actor) its project. 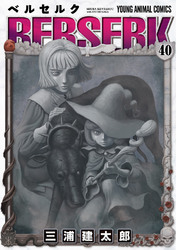 Will be out tomorrow on Berserk official site. Normally I'd say thanks for the info. But all this does is make me worry.